One of the goals of the Maui Nui Makai Network is to grow community makai (seaward) management to every moku (district) in Maui Nui. Here we offer some tools and values that have helped our community groups organize and move into action towards makai management, and invite you to read and share this information with your communities. Please contact the Network Coordinator with any questions. Almost every community group in the the Maui Nui Makai Network has completed some version of a Community Action Plan (CAP), a document that lays out a community's vision, values, project description, targets to mālama (care for), challenges and threats for their area, what actions to take towards management, how to measure and monitor change, and how to involve community in the management process. A CAP helps communities to plan their management strategy over the long run, setting their sights on achievable, priority goals and objectives. From the Network's CAPs, most of the following tools were developed and put into action. See the Community Action Plan for Maunalei Ahupua'a CMMA, Polanui Hiu, Wailuku CMMA, and Kīpahulu 'Ohana. 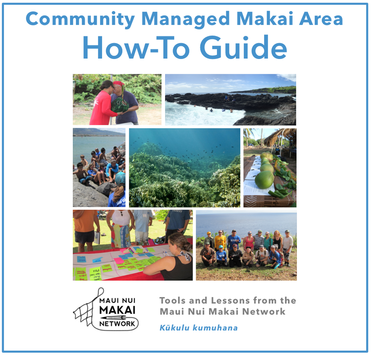 The Maui Nui Makai Network is developing a How-To Guide to provide a proven, clear process for new community groups interested in makai management to be organized, knowledgeable, and focused, enabling them to effectively engage in collaborative management with government and other partners. Movement toward co-management in Hawai'i is in-step with the global need for local action. It will lay out a series of principles and sequential activities that reflect lessons learned from the six Maui Nui groups that have gone through these steps in whole or in part, including activities to specifically incorporate native Hawaiian values, knowledge, experiences and practices, such as kuleana (responsibility) and ahupuaʻa (land division) management. When published, the guide will be open source and available on our website, intended for communities across Maui Nui, Hawai‘i nei, and beyond. Our How-To Guide is inspired by the international LMMA Network's very own guide to support community-based management. CBSFA's are areas where the community and state government work together to protect and support traditional and customary native Hawaiian fishing practices that feed the families who rely on coastal resources. Within the Maui Nui Makai Network, the communities of Hui Mālama O Mo'omomi and Kīpahulu 'Ohana are seeking CBSFA designation and rules, while Wailuku CMMA is already working in a Fisheries Management Area (FMA) in Kahului Harbor, and Polanui Hiu and Maunalei Ahupua'a CMMA are seeking other state management options. See Hui Mālama O Mo'omomi's CBSFA Proposal and Management Plan and Kīpahulu 'Ohana's CBSFA outreach handout. Also see the CBSFA Designation Procedures Guide created by the Division of Aquatic Resources. Every community group in the Maui Nui Makai Network uses pono fishing practices (sustainable practices) to perpetuate marine resources for generations to come. For example, Hui Mālama O Mo'omomi created a Pono Fishing Calendar that lets fishers know when best to harvest certain species to avoid their spawning cycles which are connected to moon phases. Wailuku CMMA hosts lawai'a (fishing) camps near Kahului harbor to promote pono fishing and Polanui Hiu is conducting creel surveys to observe, talk story, and educate ocean-goers at Polanui. 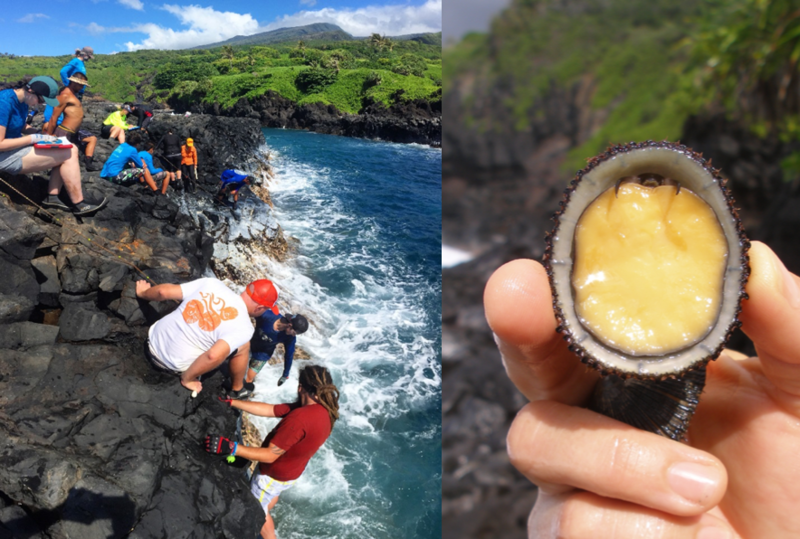 Kīpahulu 'Ohana and Nā Mamo O Mū'olea are reviving the traditional practice of resting an area from harvesting 'opihi, a native mollusk, so that it will be momona (abundant) again. The concept is simple, allowing one area to rest means those 'opihi have the chance to grow larger and produce more keiki that can spill over into neighboring areas, providing more 'opihi for all of us. The good news is 'opihi reproduce quickly - every six months - so resting an area can be an effective management strategy for this species. Partners in this project include Dr. Chris Bird with Texas A&M Corpus Christi, The Nature Conservancy, and the Haleakalā National Park. See Kīpahulu 'Ohana's 'opihi rest area poster. Since 2014, Polanui Hiu and community volunteers have been conducting monthly nearshore surveys of key reef fish species by suiting up in their snorkel gear and swimming out with data sheets and clipboards. These citizen scientists collect data that is vital to detecting changes in reef fish populations through presence, absence, and abundance surveys. The information they compile helps to ensure that management activities, including voluntary fishing guidelines, are having the desired effect and helping to restore abundance to Polanui’s reef. See Polanui Hiu's fish presence/absence surveys, fish abundance surveys, and findings from their surveys. Partner with researchers who seek to respect the intellectual property rights of community partners. In creating alliances with research partners, community groups need to have an agreed upon mission, values, goals, measurable outcomes and accountability, so that there is mutual trust, respect and commitment. Co-develop an agreement early in the research process with finite start and end dates. Formalize the agreement by signing it, revisit it at regular intervals and update as needed. Upon request, the Network can provide a template Data Sharing Agreement. Research collaborations should support and empower community groups with capacity building and knowledge for improving management. Request for research design and research results to be presented to the community group for feedback in a timely manner, and time for all collaborators to review and comment on the manuscript prior to submission to the publisher. Know that if community members have contributed to at least two of the following six steps, then they should be considered for co-authorship: 1) Initiating the original idea, concept or design; 2) Obtaining funding; 3) Provision of resources, labor or time; 4) Collecting or processing data or contributing information; 5) Analyzing data; 6) Literature search, writing and publishing the paper. If the person contributed to one step, they should be included in acknowledgements and/or a detailed list of author contributions. If community groups/members are contributing the study, they could receive payment for their time. Discuss this in advance with your partners.